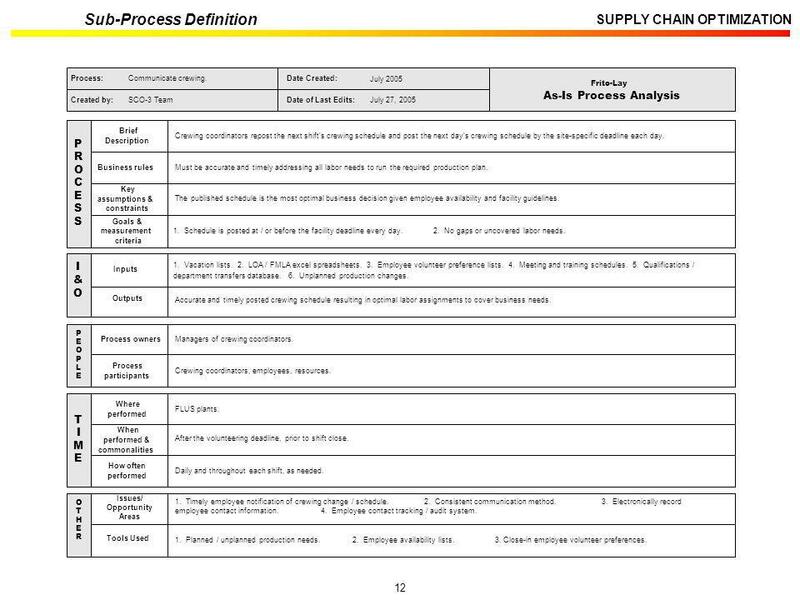 Sub-Process Definition SCO-3 Team July 27, 2005 July 2005 Frito-Lay As-Is Process Analysis Created by: Date of Last Edits: Date Created: Process: Assess and adjust next shift schedules. Brief Description Business rules Key assumptions & constraints P R O C E S Addresses unplanned over / short labor position while incorporating site specific guidelines. 1. 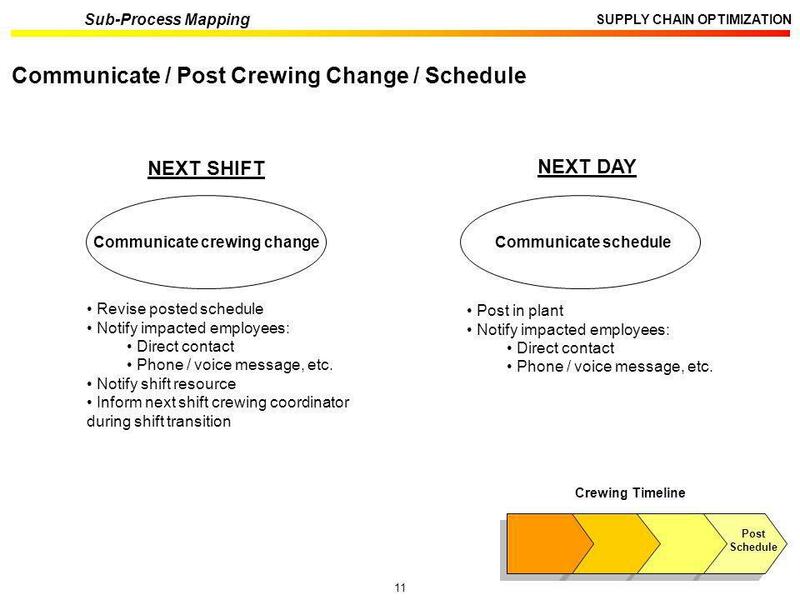 There is established, effective communication of any unplanned changes between all plant departments Resources have knowledge of attainment and unplanned changes impacting labor All manual personnel data is accurate and maintained to enable quick solution of changed work schedule ICS and / or PRM cases from production vs. schedule not readily accessible Resource availability Crewing unplanned gaps may require extensive forward planning to enable the most optimal short term solution. All labor needs are covered while minimizing production overtime and maximizing available straight time. The crewing coordinator, upon arrival and throughout the entire shift, assesses the current production performance compared to the production schedule. They adjust next shift crewing for any unplanned activity (i.e. scheduled production shortage, material / mechanical downtime, etc.). Goals & Measurement Criteria Inputs Outputs I & O 1. Actual production gaps or overage Accurate employee availability Plant specific guidelines. 1. Employee notification of changed work schedule. 2. 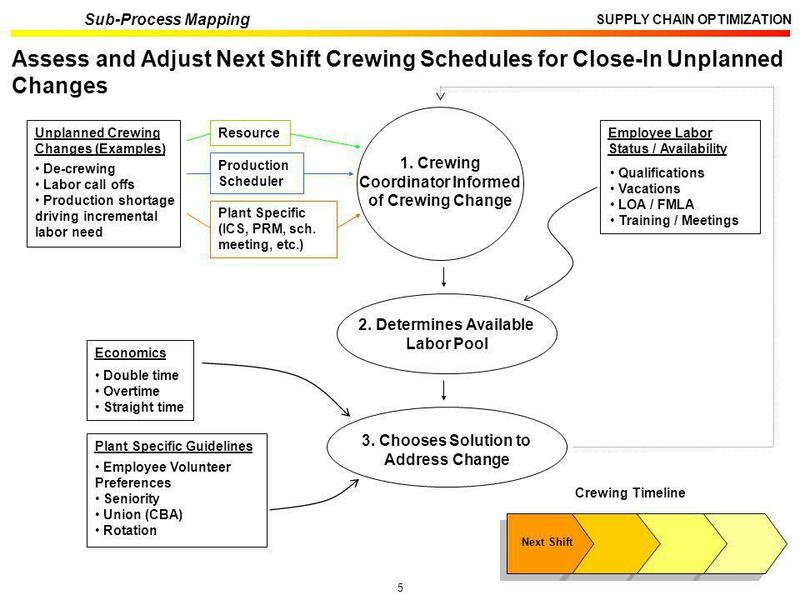 Revised labor schedule addressing close-in gaps. Process owners Process participants P E O L Managers of crewing coordinators. Crewing coordinators, employees, resources. When performed & commonalities Where performed How often T I M E FLUS plants. At the beginning of each shift and ongoing as changes arise. Dependent upon the magnitude and number of unplanned changes. Issues/ Opportunity Areas Tools Used O T H E R 1. Lack of available schedule attainment Employee data is manually maintained giving chance for human error and interpretation All crewing adjustments are manually calculated All employee selection preference enrollment is manually documented. 1. Site-specific crewing excel spreadsheets Employee availability lists Close-in employee volunteer preferences. SCO-3 Team July 27, 2005 July 2005 Frito-Lay As-Is Process Analysis Created by: Date of Last Edits: Date Created: Process: Assign next day labor requirements. Goals & measurement criteria Brief Description Business rules Key assumptions & constraints P R O C E S Addresses all labor needs to run planned production, incorporating site specific guidelines. 1. Employees place their volunteer requests prior to the site specific deadline Production schedules and employee availability lists are accurate and timely Crewing coordinator cannot crew the next day’s schedule until after the employee volunteer deadline Crewing is dependent upon timely production schedule. Next day’s crewing schedule is determined in a timely manner, while accurately incorporating planned production schedule, facility specific guidelines, minimal OT and maximum straight time. 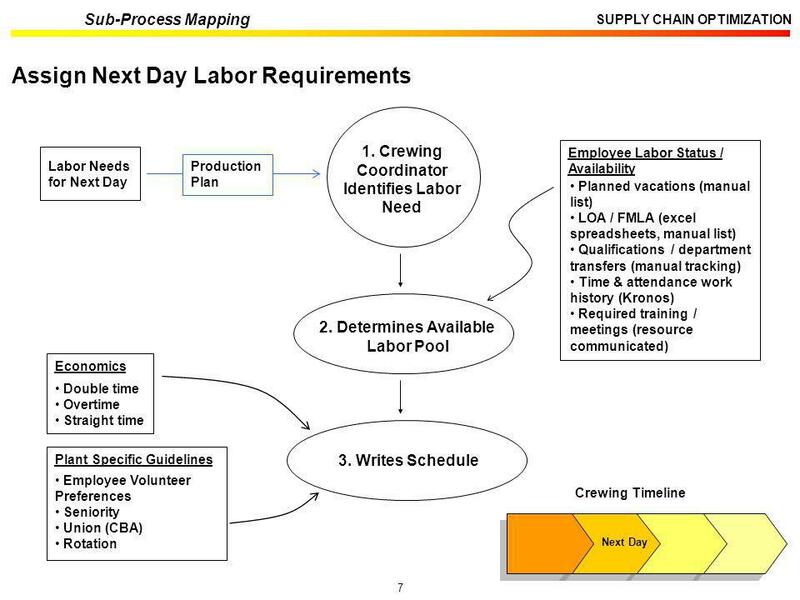 To crew the next day’s corresponding shift’s labor assignments, crewing coordinators determine the labor required to fulfill the production schedule, the available labor pool and the labor assignments. The majority of crewing coordinators are responsible for crewing one shift, which is usually the one they work. Inputs Outputs I & O 1. Planned production schedule. 2. Employee availability, qualifications, department transfers and employee volunteer preferences. Next day’s crewing work schedule. Process owners Process participants P E O L Managers of crewing coordinators. Crewing coordinators, employees, resources. When performed & commonalities Where performed How often T I M E FLUS plants. Post the employee volunteer deadline during each shift and upon receiving next day’s shift production plan. Daily during each shift. Issues/ Opportunity Areas Tools Used O T H E R 1. Timely communication of production schedule Employee availability and preference enrollment lists are manually maintained giving chance for human error and interpretation Labor decisions not standardized Time and attendance is maintained in WFC, but not automated into crewing calculations. 1. Production schedules Employee availability lists Site-specific LOA / FMLA vacation excel spreadsheets. 4. Employee volunteer preferences. 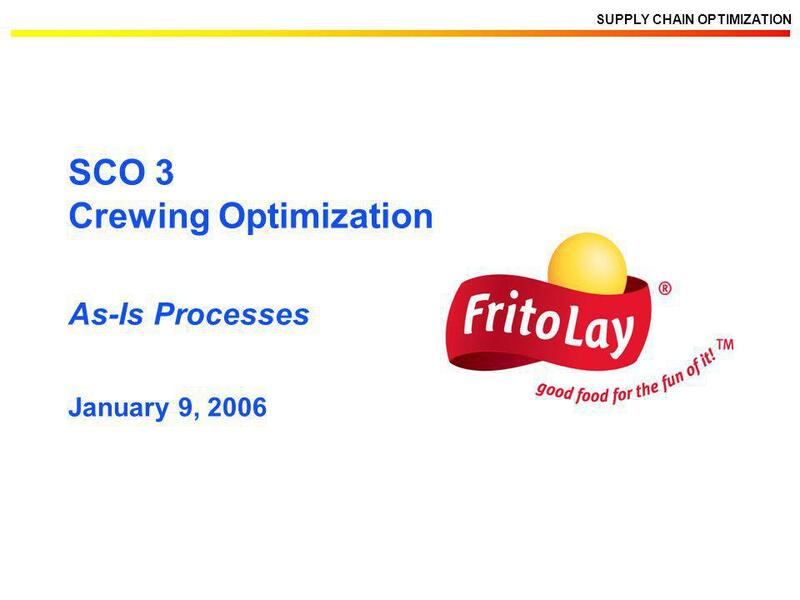 SCO-3 Team July 27, 2005 July 2005 Frito-Lay As-Is Process Analysis Created by: Date of Last Edits: Date Created: Process: Maintain and validate employee data. 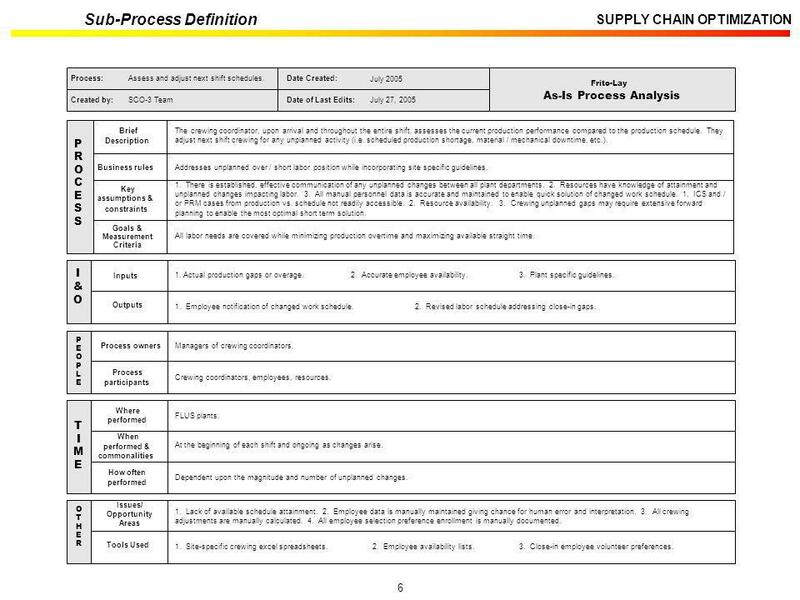 Goals & measurement criteria Brief Description Business rules Key assumptions & constraints P R O C E S Must be constantly maintained and validated. 1. Manual “sign up” process is documented and adheres to plant specific guidelines Kronos is the system of record for time and attendance Work history and qualifications performance are accurately maintained in a manual spreadsheet Resources proactively communicate training / meetings / safety / labor requirements. Employee data is accurately maintained and validated with minimal effort and maximum reliability enabling an optimized crewing schedule. Accurate employee data must be maintained in order to ensure feasible, timely crewing schedules that address the labor requirement. Inputs Outputs I & O 1. Vacation lists. 2. LOA / FMLA excel spreadsheets Kronos reports. 4. Employee volunteer preference lists. 5. Work history Training and meeting schedules Qualifications / department transfers spreadsheet. Accurate employee data generating available labor pool. Process owners Process participants P E O L Managers of crewing coordinators. Crewing coordinators, employees, resources. When performed & commonalities Where performed How often T I M E FLUS plants. Daily or during each shift, depending on workforce size and site-specific requirements. Continually updating. Issues/ Opportunity Areas Tools Used O T H E R 1. Manually difficult to optimize all the various crewing solutions to get the consistent best business decision All employee data is manually maintained giving chance for human error and interpretation Timely communication from resources to coordinator regarding crewing needs (i.e. training, safety, etc.) Time, attendance, overtime and straight time is maintained in WFC, but not automated into crewing calculations Lack of standardized decision process for crewing. 1. Employee availability lists and manual spreadsheets Kronos Meeting and training schedules Employee volunteer preferences. SCO-3 Team July 27, 2005 July 2005 Frito-Lay As-Is Process Analysis Created by: Date of Last Edits: Date Created: Process: Communicate crewing. Goals & measurement criteria Brief Description Business rules Key assumptions & constraints P R O C E S Must be accurate and timely addressing all labor needs to run the required production plan. The published schedule is the most optimal business decision given employee availability and facility guidelines. 1. Schedule is posted at / or before the facility deadline every day No gaps or uncovered labor needs. Crewing coordinators repost the next shift’s crewing schedule and post the next day’s crewing schedule by the site-specific deadline each day. Inputs Outputs I & O 1. Vacation lists LOA / FMLA excel spreadsheets Employee volunteer preference lists Meeting and training schedules Qualifications / department transfers database Unplanned production changes. 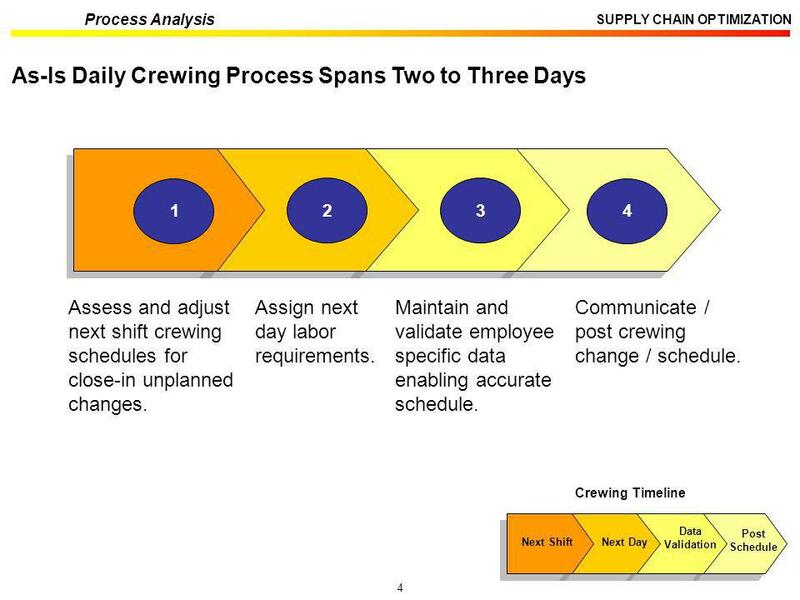 Accurate and timely posted crewing schedule resulting in optimal labor assignments to cover business needs. Process owners Process participants P E O L Managers of crewing coordinators. Crewing coordinators, employees, resources. When performed & commonalities Where performed How often T I M E FLUS plants. After the volunteering deadline, prior to shift close. Daily and throughout each shift, as needed. Issues/ Opportunity Areas Tools Used O T H E R 1. Timely employee notification of crewing change / schedule Consistent communication method Electronically record employee contact information Employee contact tracking / audit system. 1. Planned / unplanned production needs Employee availability lists Close-in employee volunteer preferences. Download ppt "SCO 3 Crewing Optimization As-Is Processes January 9, 2006"
Changes/Updates/Reminders Fall 2010 District Test Coordinator Training. Orientation to EVALUATION PROCEDURES August, 2006. Highlights: Simplify or expand data required to track time and attendance Configure timesheet formats by individual or group Maintain consistency with. CARE Tajikistan Knowledge Transfer for Key Roles ACD Program October 2006. NIMS Resource Management IS-700.A – January 2009 Visual 5.1 NIMS Command and Management Unit 5. 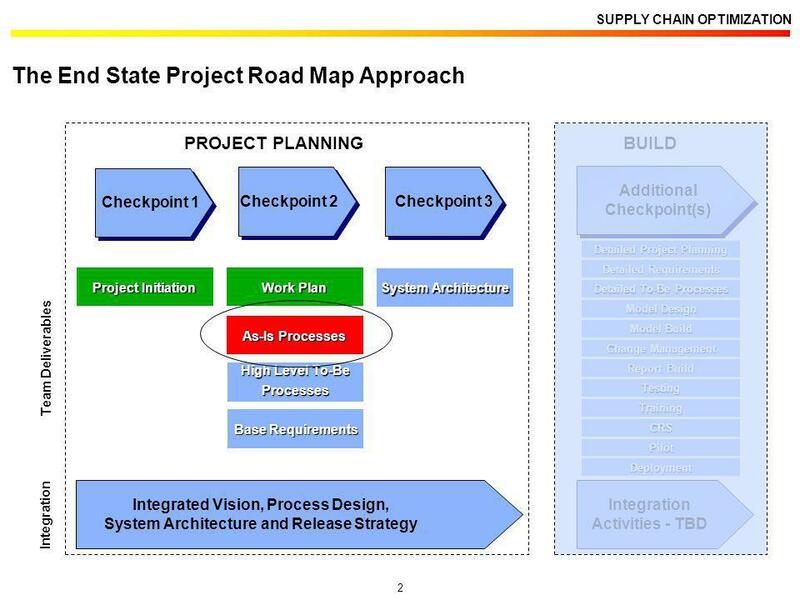 Page 2 Agenda Page 3 History –Blue Print, 2000 –GIS Process 1.2, 2001 (training only) –GIS Process 2.0, (ITIL based - not implemented) –Supply/Demand. LoboTime Agent Training Kit. Purpose of LoboTime Agent Training Kit: The purpose of this kit is to provide the LoboTime Agent with the tools and resources. 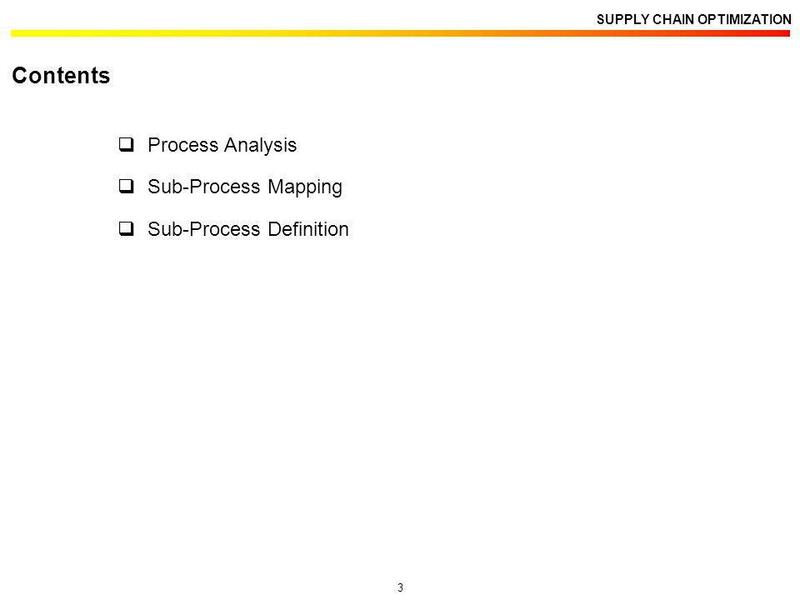 Implementation: SLA & SOP Processes Purpose Strategy Foundation We Deliver Competitive Advantage to our Customer's Global Supply Chain. 1 Meeting On The Management Of Statistical Information Systems (MSIS), Oslo, May 18-20, 2009 Shri Narayanan, Economic Systems, TGS Jola Stefanska, STA. “Hatrak Schedulers” The Best in Employee Scheduling Software Hatrak Schedulers Scheduling Made Easy A FULLY INTEGRATED SOLUTION. Sponsored by the U.S. Department of Defense © 2002 by Carnegie Mellon University July 2002 Pittsburgh, PA Lecture 6: Team Planning. Copyright 2003 Lynn Frock & Company. All Rights Reserved. 1 Five Ways to Build a Microsoft Project Schedule Lynn Frock, PMP 513-321-3187 Phone www.lynnfrock.com.